In class, students are introduced to atmospheric composition and how this can be altered by human activities. As an example, ozone is introduced as an air pollutant, mostly due to human activities. Computer models are used to illustrate the formation of ozone and demonstrate the factors that affect the concentration of ozone in the troposphere (using the SmogCity2 simulation game). The health hazards of ozone pollution are deliberated on, and the concept of 'ozone alert day' introduced. 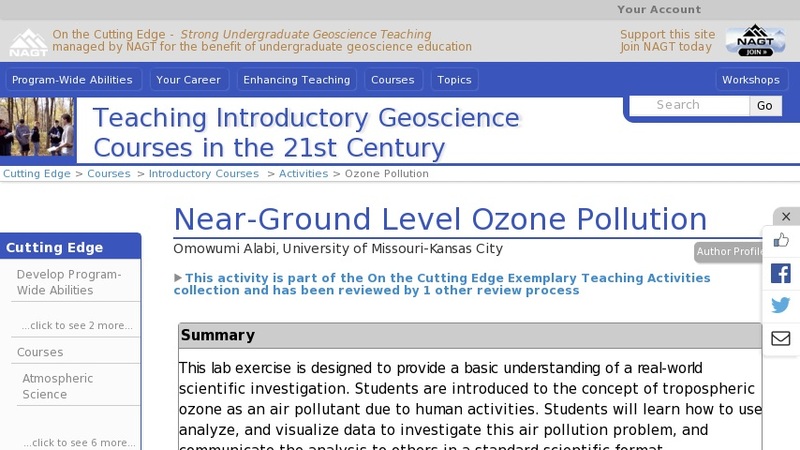 As class example, the instructor obtains data from http://airnow.gov/ to investigate the relationship between ozone pollution in Kansas City and the season. The result of the investigation is reported in a sample mini-journal paper. The students' assignment is to select a city of choice in the United States, and use data to investigate the relationship between ozone pollution and any of the following: season, human population industrialization, city location, or asthma. This activity gives students practice in using data to investigate an air pollution problem and communicate their result to others in a standard format. Each student will report the result of their investigation in a mini-journal paper, with a relevant title, and the following sub-sections: an abstract, introduction, methods, results, discussion and references. Guided by a grading rubric, this activity helps student to learn how to a write technical paper.